Click here to join QT Connect. Click here to update your member profile. What if I have a friend or family member who wants to be a QT Connect member? 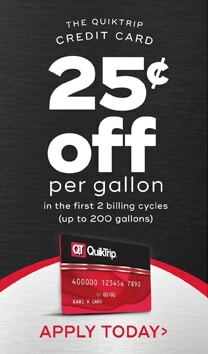 Can I receive my coupons through the QT App? No. The QT App is not connected with our research / survey program. Click the 'unsubscribe' link in any of the survey emails that you receive from QT Connect or email qtconnect@quiktrip.com. How often will a survey / coupon be sent out? Surveys will go out randomly throughout the year as our needs require it. You may receive a survey that another member does not. You may receive a survey once a month, every 3 months, or six months. How many times can a coupon be redeemed? Only one coupon is allowed to be redeemed for each survey completed. Once I receive my coupon, how long do I have to redeem it? The expiration date will be on the coupon. What if the survey link does not work? You may want to ensure that your browser is set to allow 'cookies.' Supported environment for our surveys and links are Internet Explorer 7 or 8, Firefox 3.0, Safari 4.0, Chrome and many mobile environments. Please ensure that you are attempting to complete the survey from one of these supported browsers. Can the store scan the coupon from my phone? Yes, our coupons are now mobile friendly. You can still print them as well if you wish. We ask that each member only have one email account listed. If more than one account is found, QT Connect will ask you which account should be deleted before taking action.